Download this free guide and get your 2015 marketing strategy off to a flying start. One of the new year’s resolutions here in our marketing team is likely to be something along the lines of ‘take more risks.’ We’ll push to try new things and not just stick with what we know. And when looking into the new tools, techniques and strategies we’ll employ it’s the research that of course underpins the decisions we’ll make. Being informed and having the right information on-hand is so important that we now dedicate a lot of time and resource into creating just that ourselves, so that marketers, analysts and decision makers are able to learn how social listening can benefit them. Our latest piece of downloadable content is a guide on influencer marketing. Think it’s just a fashionable phrase? Not so. Influencer marketing can equal big business. Big money. Our guide – one of an ongoing use case series – will show you how using influencers to contribute to the marketing of your product can supercharge your campaigns and help you reach a bigger, more relevant audience than ever before. In essence, influencer marketing is a very simple notion: a brand using the influence of an individual to increase awareness or sales of its products. Speaking broadly, this may include celebrity endorsements or sports sponsorship; campaigns that take place offline, via traditional media. In this guide we are focusing on how in particular the web and social media can be used for influencer marketing. As such, with the growth of content marketing, subtler, less direct tactics may be employed, where the influencer is promoting a piece of content from a brand, rather than explicitly a product or service. So, the specific goal may be referred traffic, link backs, lead generation, direct sales or simply reach or impressions. How exactly the influencers are sourced, partnered with and of course measured will be affected by which goals are prioritised. It is also important to remember that when you’re looking to your end goal, different companies offer different metrics – MozRank differs from Kred, which in turn differs from Klout. You need to work out which metrics suit you and your campaign, and build on them. We’ve got loads more info in our influencer marketing FAQ too. A key focus of any influencer marketing campaign is starting with finding the right people. Once you’ve established a brief of what you want to achieve and what your angle for engaging advocates is going to be, every influencer marketing campaign should start with planned and meticulous research. But your research is only as good as the technology that underpins it. Finding high quality, relevant targets for outreach is absolutely paramount to success. Without a well honed set of influencers to go after, you risk wasting valuable time later on as you find your targets are outdated, irrelevant, based in the wrong location, not PR-friendly or any other number of hurdles. Of course, your tactics will need to differ depending on which platform you’re looking at. But you don’t want to leave it there. Following the execution of the content and the output from your influencers, you’re going to need to measure. Did you want awareness? You could see how that translates into online mentions. Did you want to increase your brand profile? Perhaps that means a rise in Twitter followers of Facebook likes. Maybe you wanted traffic or even sales – so make sure your measurement process is able to shed light on this as much as possible via site visit/conversion data. We’ve covered off how you can do the above, explained in detail where you should be focusing your efforts and given working examples of how big-name brands have used influencer marketing to their advantage in the guide. We’ve also packed it full of tips on how to make your social listening tool work harder for you by applying filters and using specific metrics to learn more about the people you should be targeting. Want to find out more? 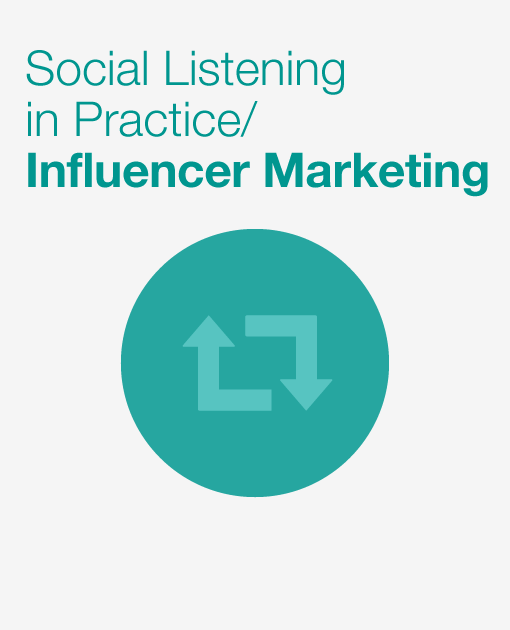 You can download the Social Listening in Practice: Influencer Marketing guide by clicking below. And, as always, it’s free. Now, treat yourself to a mince pie for thinking ahead to 2015. The hard work is almost done.